Gen. Kukiel żegna Szkocję na uroczystościach w Perth. „ Perth, które przez półtora roku było ośrodkiem polskiego ży­cia wojskowego, zaroiło się znów w ubiegłą sobotę od mun­durów polskich. 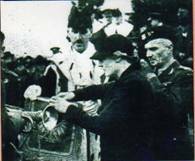 of the 1st Polish Army Corps, in grateful appreciation of the friendship extended to them in the City and County of Perth, where the Polish troops, after undergoing trials and hardships, were able to rally and continue with their Allies the fight for freedom and liberty." “ Standing on the historic assembly ground of the North Inch on Satur­day afternoon, near the very spot where the Battle of the Clans was fought 546 years ago, Polish soldiers watched the forging of yet another link in the chain of mutual understanding and alliance between their country and Scotland. This latest symbol of unity took the form of a set of trumpet ban­ners which was presented to our allies by the City of Perth. In the presence of the magistrates and high officers of the Polish Army, Mrs Nimmo, wife of the Lord Provost. tied the banners to the trumpets, and the six heralds sounded a fanfare. 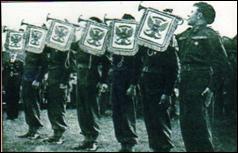 The six trumpet banners were a gift to 1st Corps Recce Regiment, which since October 1940 up to early April 1942 had been stationed in Perth. The Lord Provost’s wife tieing the banners to the trumpets. The banners were made by the Glasgow School of Art. The banners were embroidered on one side with the Polish Eagle and on the other with the Coat of Arms of Perth.